The tradition of woodcarving existed in India from ancient times. The early wood -carved temples bear witness for this. Wood -carved temples are surviving till date in Himachal Pradesh and Uttar Pradesh.In India, each region has developed its own style of structures and carvings. Local traditions and locally available wood varieties influence them a lot. Number of folk forms has been developed in woodwork all over India. Toys for children, utility goods and religious objects are the main ones. Woodcarving also helps develop templates that today can be used for many things. Woodwork from India can give inspiration for decorating the home or designing. The whole of North India has a tradition of carved wooden doors with intricate designs, brass inlay and trellis work for the windows. Assam, which has extensive forests, has a rich tradition of wood works. Their places of worship included large carvings of mythical figures like half-man, garuda, hanuman, lion, etc. Also the carvers create a Simhasana wherein they place the deity to be worshipped. In Bengal, the clay houses have large wooden pillars and beams with intricate carvings. In Kashmir, the houses are lined with wood, with ceilings worked in geometrical patterns and lattice- worked windows made up of pieces of wood locally known as Pinjara. The state also produces many wood carved items like furniture, screens, boxes, bowls, etc. These are mostly prepared from walnut wood, which is in abundance here. 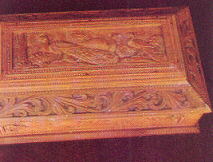 Decorative wood panels used for ceilings and pillars is a special craft in Kashmir and it is called Khatamband. Gujarat too is rich in wood carving tradition. Sections of Ahmedabad city have houses with carved facades. Balconies jut out of the houses with carved and perforated patterns. Tamilnadu has a well -developed tradition of woodcarving used for decorating houses and temples. The Tanjore dolls made of wood form a part of the rituals followed here and they are also used for educating small children. Andhra Pradesh has a tradition of manufacturing woodcarvings for religious centers. The Tirupathi red dolls are meant for sales for the pilgrims. In a village called Nirmal in Andhra, carriers of the main deities called Vahanams are made by means of a soft wood.Another village called Kondapalli is famous for its toys made of Punki wood. Very meticulous attention is paid in their making. Kerala state has one of the richest traditions in woodcarving. The houses here have carved pillars and beams. Most of the houses have a carved family temple. Kerala wood -carvers also work wonders on sandalwood and rosewood. Kerala woodcarvings have strength of form, which is reminiscent of the murals and dance forms of the area. Large wood carved figures are prepared in the round as well as in relief work. In Punjab, old havelis have carved doors and windows. 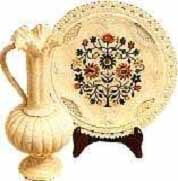 Woodcarving and inlay are now practiced in Hoshiarpur. Jalandhar is specialized in lacquer- turned furniture. In Uttar Pradesh, Saharanpur is an important center in woodcarving. Screens and room- dividers with carved patterns and ivory -inlays with minute details are produced here. Nagina is another important wood carving center in U.P. Manipur is an important center for Tarkashi, metal thread work, done in furniture. Sankheda in Gujarat is an important center for lathe- worked lacquered furniture. The surface is painted with designs on a lacquered background. This is used to give silver- like effect. Bedposts and cradles and toys for kids are also made here. Surat has a tradition of marquetry work, which is also called Sadeli. In this, different materials like ivory, ebony, sandalwood, metal having different textures and colors are used. These materials are made into strips with their width shaped as triangles, squares and circles. These are then joined by gum to get a geometrical pattern. Theyare then cut across into thin strips and pasted on a wooden background ,mostly boxes. Wooden blocks for printing in textiles are also made in Gujarat. The design is first stenciled on the wood and then the intervening spaces are chipped out. Karnataka is specialised in sandalwood carving. Earlier the deities were carved out of sandalwood but now boxes are their specialty. The Srigandha variety of sandalwood is used for this purpose. They have a distinctive aroma that sets them apart from other woods. Large boxes covered with mythological scenes are an important product of Mysore, Kumta and Sagar. 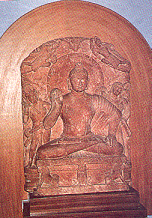 In south Kanara, life-size wood carving of Buddha figures is carried out. Mysore city developed an intricate form of ivory -inlay on wood. The ceilings and doors of Mysore Palace are expressions of this special skill of its artisans. In Rajasthan, wooden figures of Ghangore, a form of Parvathi is worshipped. These stylized forms are manufactured in a village called Bassi in Chittogarh district. The village also specializes in making a wooden temple like structure, which can be folded into a book form called Kavadh. In Odisha, the main deity of the famed Puri temple, Lord Jagannath is reproduced in wood. A number of wooden masks are also made for the traditional Sahi Jatra. Nagaland has a tradition of manufacturing statues as well as Commemorative pillars in wood. The art of stone carving developed in India, a little later when compared to woodcarving. India has a huge resource of different variety of stones and our skilled craftsmen impart life into them. The Indian craftsman's mastery over stone is best revealed in the architecture and sculptures found in Khajuraho temples. 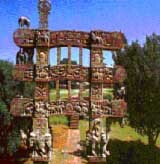 The intricate carvings found at Sanchi are among the finest found anywhere in the world. Gaya, a pilgrim site for the Buddhists also has an ancient tradition of stone carving. The ancient stone carvers were guided by the Shilpa Shastra, which clearly laid the rules for them. The main deity was carved by specialists who were knowledgeable in the properties of different stones, their grain, as well as their proportion needed for the carving. The act of carving the deity was considered as an act of worship and was considered as a sacred ritual. Stone temples are built even today and the Sthapathis of Tamilnadu as well as the Somapuras of Gujarat and Rajasthan are in good demand throughout the country. Varanasi is an important center for stone carving works. Here a community of people called the Raidas do it. Around Varanasi, Hamirpur, Tehri Garhwal and Bageshwar are famous for statue works whereas Banda is known for agate stone works. 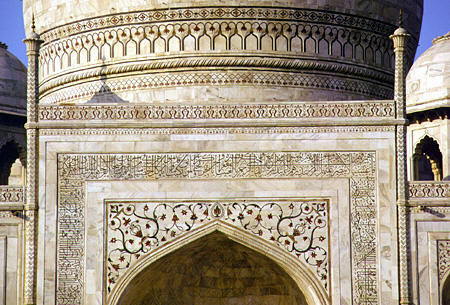 Agra in Uttar Pradesh is famous for its marble stone works. Many pieces like lattice windows, mirror frames, carved brackets, canopies, pendants and filigree works are carved here. The craftsmen are famous for their inlay works. Mostly geometrical and floral patterns are worked on using colored stones and semi precious ones. Rajasthan maintains a rich tradition of stone carving even in the common domestic buildings. Doorframes are commonly built of red stones. Windows have stone trellis works and even the supporting frame for the loom is made of carved stones. Jaipur is one of the most important centers where a large community of stone carvers carve deities in marble. Large commemorative stones are a common sight in Rajasthan as well as in Gujarat. Odisha also has a tradition of stone carving. Besides the main deity they also carve figures for the temple friezes. Nowadays soft stones are used for carving small souvenir items, which are meant for sales to the tourists. Mahabalipuram in Tamilnadu deals with hard granite stone carvings. There is also a school for training the Sthapathis according to the rules of the ancient Shilpa Shastras. In Karnataka, Devanahalli a village near Mysore produces carved figures in relief on black stone. The figures appear to have movement and strength in their postures. The figures not only have the effect of light and shade and a rounded form but also a linear quality. Durgi, in Andhra Pradesh is another stone carving center where large nandis, bulls and local deity images are carved. Ivory carving is one of the most ancient crafts of India. Ivory is a precious material and a difficult one to carve; yet the Indian craftsmen have mastered this art from ancient times. Export of these ivory carved items continued from the Roman times. The important centers for ivory carving are Trivandrum in Kerala, Mysore and Bangalore in Karnataka, Delhi, Jaipur and Jodhpur in Rajasthan, Varanasi in Uttar Pradesh, Amritsar in Punjab, Benrampore in West Bengal and Ganjam and Puri in Odisha. Kerala specializes in the carving of God and Goddesses images in Ivory. The carvings are in the round and are based on the different styles of the temple sculptures of the area. The master craftsmen of Kerala make many other figures with rhythmic and expressive stances. Mysore developed this craft under the patronage of the Royal court. The artists prepare deities, carved bedposts and intricate inlay patterns for doors, windows and ceilings. 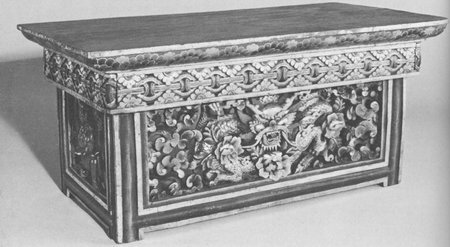 In North India, ivory carving developed during the reign of the Mughals. Delhi and Lucknow are important centers noted for their floral motifs, geometrical patterns carved in low relief or worked in fine Jali work. Small items like caskets and pen cases are also produced. Fine latticework boxes are their other specialty. Delhi is also known for its ivory costume jewellery. Rajasthan and Gujarat ere important centers for ivory bangles for women. The lathe- worked ivory bangles are lacquered in red and are given to the women folk during their marriage. 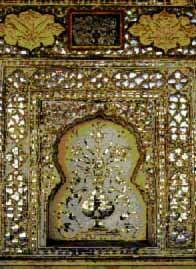 Amritsar in Punjab developed ivory carving during the Sikh rule. It is famous for table lamps, bracelets and chess sets in ivory. Varanasi also produces many designs based on local traditions, as it is a big pilgrim center for the Hindus and Buddhists. West Bengal has its own style of carving based on local folk traditions. Intricately carved figures of elephants and Goddess Durga are the common items done here. Odisha also has an important tradition of ivory carving. Ancient temples and palaces here have ivory carved items like the mithuna figure, etc. Of late this craft is dying as the Indian Government has bannedelephant poaching and on ivory- working. Hence the carvers are turning onto other crafts particularly, bone- carving. This craft has been prevalent in India from ancient times. The tribals are usually associated with this craft. The Himalayan tribals practice this craft for making ritual items. In Odisha, bone carvings of animals and mithuna figures are common. Carved combs of bones and horns are a specialty. The most important centers include Sarai Tarin in Uttar Pradesh, Cuttack and Parlakimedi in Odisha, Honawar in Karnataka and Trivandrum in Kerala. Decorative combs, buttons, flower vases, penholders, cutlery items, toys are some of the common items that are done in these places. The Horn combs prepared in India are very popular throughout the world. In Cuttack horn and filigree work are combined to produce decorative jewels, bangles, etc. The craftsmen of Trivandrum are famous for making different kinds of crane birds in horn.